Janet Lynn was only 3 years-old when she laced up a pair of ice skates for the first time in the fall of 1956. Little did her parents, Florian and Ethelyne Nowicki, realize that in less than 13 years their “little daughter” would blossom into America’s figure skating sweetheart and win the first of her five consecutive U.S. National Championships. The Nowickis lived in Evergreen Park, Illinois, a southwest suburb of Chicago, but later moved to Rockford, near the Wisconsin border, so Janet could train at the famed Wagon Wheel Ice Palace. By the time Janet was 8 years old she was a sensation on the ice and competed against skaters 11 and 12 years old. In 1964, at the age of 9, she became the youngest female to pass all eight tests conducted by the United States Figure Skating Association. The little blonde bombshell won her first national championship when she captured the U.S. Junior title in 1966 as a 4-foot-6-inch, 80-pound, 12-year-old. The victory earned Janet a trip to Germany where she placed second in her first international competition. “Practicing eight hours a day, six days a week-in addition to my school work-really paid off for me when I made the U.S Winter Olympic Team in 1968,” she recalls. The following year, Fleming turned professional and was not eligible to defend her U.S. National Championship. “Tina Noyes, our Olympic teammate, was the favorite at the 1969 Nationals in Seattle because she had finished second to Peggy the four previous years. But I put it all together and won my first U.S. Ladies Championship,” Lynn said. The victory gave Janet all the confidence she needed, and she went on to defend her title the following four years (1970-73). In world competition, she captured a bronze medal in 1972 and silver in 1973. In addition to skating and her high school studies (which earned her election into the National Honor Society), Janet found time to take ballet and gymnastics lessons. She also took organ lessons to get a better feel for moving to the music while skating. Janet was a decided favorite of the crowds at the 1972 Winter Olympics in Sapporo, Japan. She dazzled the audience with her free skating, but fell behind with not enough points in the dull compulsory competition. America’s hope still came home with a bronze medal for third place. 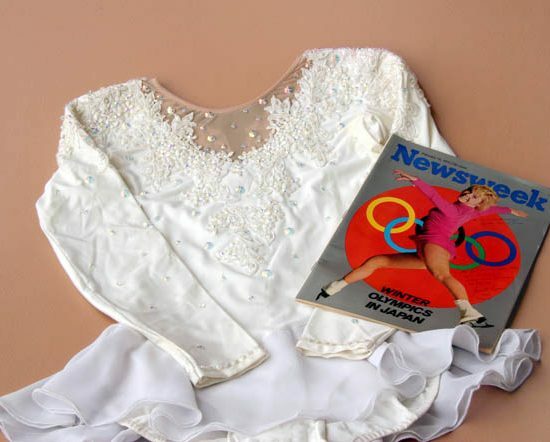 Before the Olympics, Lynn’s photograph was on the cover of Newsweek magazine. Eventually, the 19-year-old’s charisma on ice caught the eye of Ice Follies, and she became the first female athlete to sign an unprecedented $1.45 million contract, to be paid over a three-year period. Unfortunately, Janet never completed her professional contract because of severe asthma attacks. “Nowicki” is hard for some people to pronounce as well as spell. It’s hard to understand over a public address system during an ice show. Skating is a very political sport with lots of unpredictable people, and let’s not distract, say, a Russian judge with a Polish name on an American skater. “My folks agreed that on the ice I could easily use my first and middle names. Later on, some Polish-American groups frowned on that, but it was probably still the wisest move for me,” Janet explained. And so, Janet Lynn Nowicki became just plain Janet Lynn.